The 13th Edition of European Law Students Association (ELSA) WTO Moot Court Competition Geneva, Switzerlandis one of the prestigious mooting competitions among all national and international moots. The ELSA Moot Court Competition (EMCC) is a simulated hearing of the Dispute Settlement System of the World Trade Organization and deals with international trade law issues. The competition is organized since 12 years and open to law students from all over the globe. 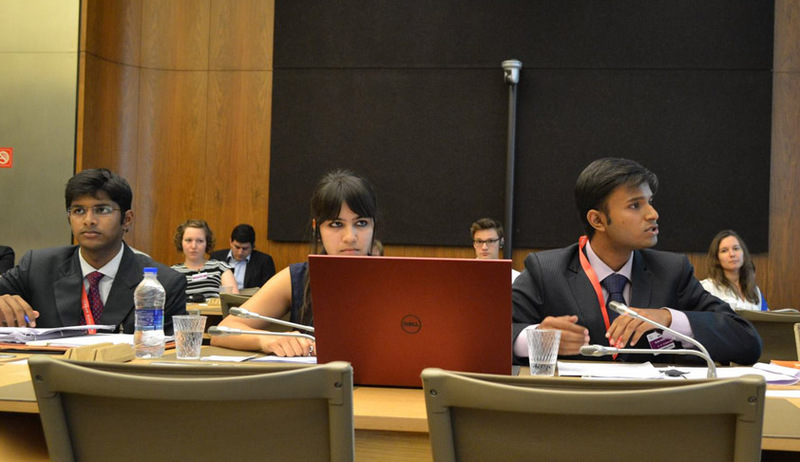 The final Oral Round took place at the WTO Headquarters in Geneva, Switzerland in the month of May. The team consisting of Vatsal Vasudev, Sudipand Rhea from National Law University, Jodhpur were the runner up in the competition and Vatasal Vasudev won the Best Speaker citation in the competition. LiveLaw: How do you feel about such a big achievement? Team: We worked on the competition for more than ten months, so I am happy that it ended on a high. Losing out by 1 mark on team score despite having higher individual speaker scores than the opponents niggled for a while, but the overall experience was highly fulfilling. LiveLaw: What was your motivation behind opting to dothis moot? Why did you decide to do this moot? Team: I chose this moot because I was interested in trade law and this is the most prestigious moot court competition on the subject. LiveLaw: What difference did you find in ELSA WTO Moot Court Competition as compared to other National and international Moot Court Competitions? Team: In ELSA, the focus was on testing the speaker’s understanding of the law and facts involved and the consistency of his arguments, as opposed to a national moot I have done where the focus was on testing the speaker’s composure under stressful questioning. LiveLaw: What is the most important thing you learnt while preparing and competing this moot? Team: The importance of teamwork. LiveLaw: What was the toughest part while preparing and mooting? Team: There was a lot of matter to present in a limited amount of time, so time management was the trickiest part in my opinion. LiveLaw: Did any one of you feel like giving up at any point of time? If yes, how did you guys motivate each other? Team: I think the motivation level of our team was pretty high throughout. LiveLaw: How did you guys come up with such a fantastic team? Team: I was just lucky to have great teammates. I had a word with my teammates before allocation of the moot and after a little bit of convincing, everyone was ready to take up the moot. LiveLaw: What pattern did you adopt for your preparation? How did you divide your work? Team: Each member was entrusted with a couple of issues and I am happy to say that all my teammates did complete justice to the issues they were entrusted with. LiveLaw: How many National and International Moot Competition have you guys participated in and won? Team: I did a national moot before this where my team got the award for the best memorial. LiveLaw: What area of law would you guys like to gain expertise in? Has this moot changed your mind set regarding the area you would like to gain expertise in? Team: I am specializing in International Trade and Investment. LiveLaw: How did you balance your academic performance or internship with the preparation of the moot? Team: I missed a few classes and optional tests, but it was a worthwhile trade-off. LiveLaw: What would you like to do after law school? Team: I have been recruited by a law firm so I will work with it after I graduate. LiveLaw: How was it like working with the team? What were your team’s fortes? What roadblocks did you guys face? Team: It was a pleasure to work with the team. Our forte was that everyone was genuinely willing to learn the subject. I don’t recall any major roadblocks which inconvenienced us. LiveLaw: Which area of trade law was the question was based on? Team: It was based on the Agreement on Technical Barriers to Trade and the GATT. LiveLaw: How many months before the competition did the team start preparing for the moots? Team: We started preparing once the team was formed, which was about three weeks before the release of the case. LiveLaw: How many teams were you up against in the competition? Which team would you consider to be your toughest competitor? Team: 20 teams participated in the world rounds. We had 5 rounds against 4 teams (twice against Harvard Law School). All competitors were quite strong. I think on law, the team from KU Leuven University, Belgium, whom we met in the Quarterfinals, was the strongest competitor we faced and the team from NUJS was excellent with their presentation. LiveLaw: What do you think got you success to reach tillfinals? Team: Thorough preparations and absence of bad luck. LiveLaw: A lot depends on the memorial when it comes to speaking. How well do you think this statement is justified in your team’s perspective? Team: The format of ELSA is such that the judges do not have a copy of the teams’ memorials. Also, memorial score is not taken into account at the knock-out stage. So dependence on the memorial is relatively lesser in ELSA compared to other moots. LiveLaw: How did you prepare for the oral rounds? Team: Focused on making a concise transcript and practiced before a few alumni from my University prior to the regional round. LiveLaw: What message would you like to pass on to the mooters and the non- mooters out there? What is your advice to someone who has never mooted before? Team: I did not moot a lot before this competition but when I got really interested in a subject, I took up a moot related to it and it worked well for me. We thank you for your time and wish you all the very best for all your future endeavour ! !